Not only are there flowers in the desert, there are animals as well. 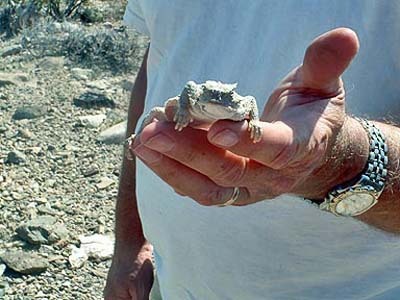 The Horny Toad is fun to find and examine. The correct name is “short horned lizard” Yes, they are lizards. They are not harmed if handled carefully and not stressed. This guy posed for our pictures and then stretched out happily on his rock when returned to it. Horned Toad numbers are in decline thought not yet classified as endangered. 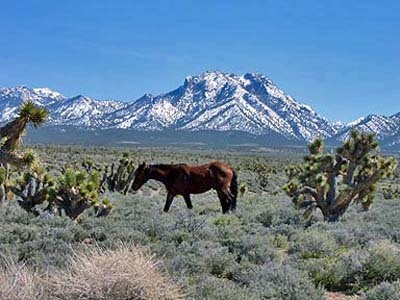 Wild horses are not native to America. They are descendants of those brought to our shores by the Spanish in the 15th Century. Being feral rather than native has caused may naturalists to campaign for their removal from the Western US. On the other hand, they are ingrained in the history of the West so the battle goes on. Their numbers are controlled and many are rounded up and sold at auction with the proviso that they may not be slaughtered. A solitary stallion back dropped by Mt. Charleston. This mountain offered great viewpoints for the nuclear tests of the 1950’s. 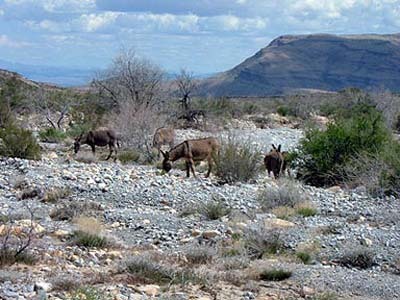 Wild burros are also feral. 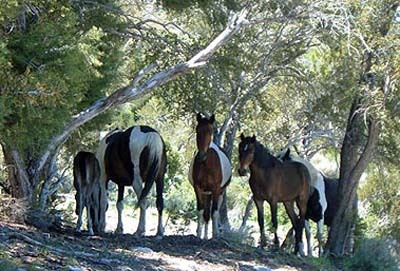 They are not as numerous as wild horses but can cause as much damage to the landscape as the horses. They are controlled in the same way as horses. This guy has become someway domesticated and is looking for a handout. Caution is advised as they may deliver a nasty bite when tasking that handout. This Mountain Sheep was in his weathervane mode. He stood on this rock for a long time allowing for some great photos. A Desert Tarantula , often described as big, hairy, and scary is not dangerous when handled properly. It does have venom fangs but they are rarely used other than to capture prey. The danger lies in the hairs that covers this big spider. They break off easily and have barbs on the end that may embed themselves in flesh. They use a defensive mechanism where they raise upright and flick off hairs from their abdomen into the eyes and noses of those that decide to investigate them too closely. The Desert Tortoise is an endangered species who’s numbers have rapidly decreased since the 1950’s. This one is in a captive breeding program. We came across this one out in the wild. We were careful not to flatten him with our jeep tires. 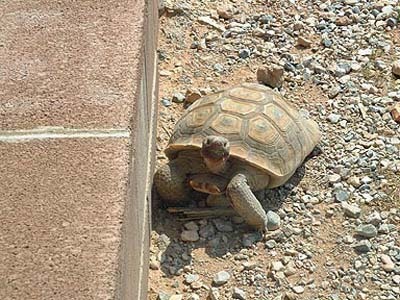 Industrial operations in the desert such as rock queries and mines are required to fence their areas to keep the tortoise out so they do not become road kill. They must also search the area before starting operations and periodically during them and remove any tortoises that may have wandered in. This baby was also found in the wild. A tortoise may lay up to 100 eggs but only 2-3 hatching’s will reach maturity. 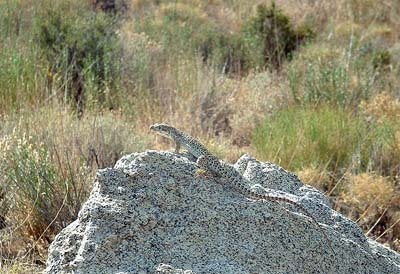 My ID of this guy is a “Greater Earless Lizard” which may or may not be correct. 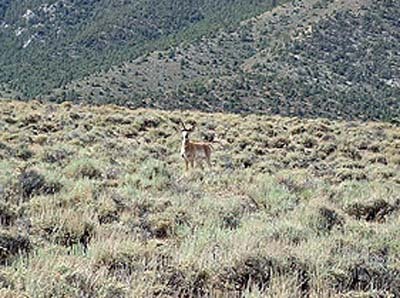 This mule deer is eyeing us from a distance, deciding whether to wait or flee.